The girls had finished their last match around noon on Monday, the last of three estrogen/adrenalin-fueled days of volleyball competition in Las Vegas. Once again I was on my own to drive back to San Jose while wife and daughter flew out in the afternoon. I planned to spend the next three days hiking in nearby Red Rocks but found myself unexpectedly with a half day to kill with something more than sitting on my duff. I decided to head to Calico Basin to tackle a handful of summits in the Calico Hills. With more than seven closely-spaced summits amidst a sandstone and limestone playground, it seemed a fine introduction to the Red Rocks area. I parked at the end of the road in Calico Basin, just outside the large lot that was filled to capacity. These two summits lie directly to the north atop a large red/orange sandstone formation. Bouldering is quite popular among the large blocks that can be found scattered about the edge of the mountain on the south side, a short walk from the parking lot. Young 20-somethings can be seen plying the trails with crashpads strapped to their backs, looking for an unoccupied bouldering site which are easy to identify by the white chalk marks that cover key holds on the rock. I walked past these and then towards the east end of the mountain behind them, aiming for a break in the cliffs that characterize its southern aspect. It took about 30min to climb up from the bouldering areas onto the East Ridge and then to the summit. The most interesting part of the peak is its class 3-4 summit block. This is most easily climbed on the east side where thin ledges provide adequate hand and foot holds. The summit has a register that goes back only to 2009, actually one of the older ones to be found in Red Rocks, as I would come to find. The summit has one of the better views in Red Rocks of the sprawling Las Vegas Valley and today there was little smog to mar the view. To the south is Calico Basin framed by Blue Diamond Hill (more of a large mesa) in the background. Greycap and the La Madre Wilderness rise high to the north while Kraft dominates the view west and it was to this I headed next. There is little prominence to Big Bird, which means there is little elevation loss traversing between the two peaks. 20min was all that was needed to get from one to the other over a bouldery sandstone landscape connecting them. A couple were picnicking on a large, flatish rock just south of the summit, and I spent only a moment at the summit to look for a register (in vain) before moving on to leave them to their romantic solitude. More sandstone scrambling to the west took me down to a maintained trail between Kraft Mtn and New Peak. This appears to be a fairly popular hiking route as I saw several parties plying it in the short time I was there. Immediately west of this trail rises New Peak, the highpoint of the Calico Hills. It is almost entirely made of limestone which in contrast to the colorful and fun-to-scramble sandstone, makes it rather blase. 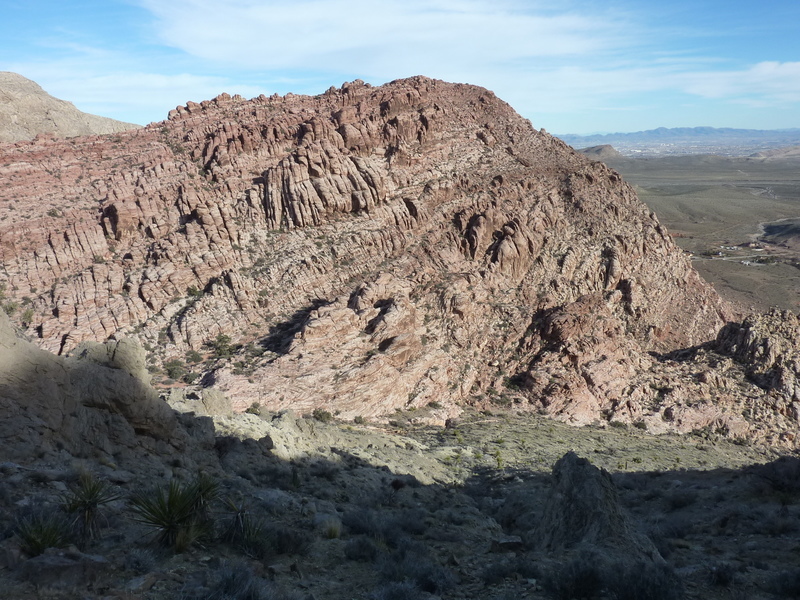 The rock tends to be crumbly and no different than hundreds of other summits scattered across the Mojave Desert. Still, as the highpoint it has a commanding view overlooking the rest of the Calico Hills and provides a perspective on which routes might work to reach the other points. After perusing the more interesting sandstone that lay ahead, I continued northwest off New Peak. I dropped to a wash between New and Red Cap, then began finding my way up the east side of Red Cap, and it was here that things got interesting and really fun. One can generally find ducked routes leading to most of Red Rocks many summits, or, to up the ante, simply make up your own route which I soon found myself doing. The east side of Red Cap is characterized by huge sandstone blocks, slabs and tricky route-finding. I followed along thin ledges and through narrow gaps, getting stopped in my tracks in places only to find an alternative that "just" worked. It was great fun and the only downside was that it consumed only about 15min, much too short, really. There is a beautiful tinaja (spanish for a small pool in a rocky hollow) on the northwest side of the summit block that makes for fantastic pictures. The summit block itself requires a short class 4 off-width crack climb on the northwest side that took me a few minute to manage. After taking a couple pictures and returning to the tinaja, I met a couple making their way up. I commented something like, "that last part is a bit of a challenge," to which he replied, "yeah, I was up here this morning." I watched him scramble up the crux in less than half the time it took me while his companion watched on. Clearly he was no beginner and was intimately familiar with the area. Located less than half a mile SE of Red Cap, Tank Peak proved another enjoyable adventure. I spent about 30min scrambling between the two, finding all sorts of challenges to keep the fun to a high level. Meanwhile, the other two could be heard behind me in conversation making their way to Tank Peak as well, far more casually than I felt I was doing. I was moving about as fast as I could without any familiarity with the route, not sure what option would work and which wouldn't, but making a pretty good stab at it. Eventually finding my way to Tank Peak, the other two were only a short distance behind. I struck up a conversation with Jimmy in order to ask his advice on how to get back down to Calico Basin. It was closing in on 5pm and just over half an hour to sunset and I didn't want to waste unnecessary effort in extracting myself from the sandstone cliffs. Jimmy was quite helpful and directed me down a steep gully immediately off the SE side. This turned out to be a ducked route leading up from Calico Basin and was just the ticket for getting myself back in short order. I disturbed a grey fox on my way down, who proved to be a most agile climber. It first darted down the gully to hide behind a rock, only to fly back up the gully in a hurry as I passed by. Lower down I came across a dad with two pre-teen daughters (not looking so confident on the steep rock) on the way up. Another group of perhaps a dozen teenagers were scrambling in all different directions on their way up towards West Calico Tank. They weren't following any fixed route and some of their party had already turned back while the braver members jeered them from above. With sunset not far away, they seemed to have a rather cavalier attitude towards the whole thing - I was happy to extract myself from the scene and leave them to their shouting and bravado.